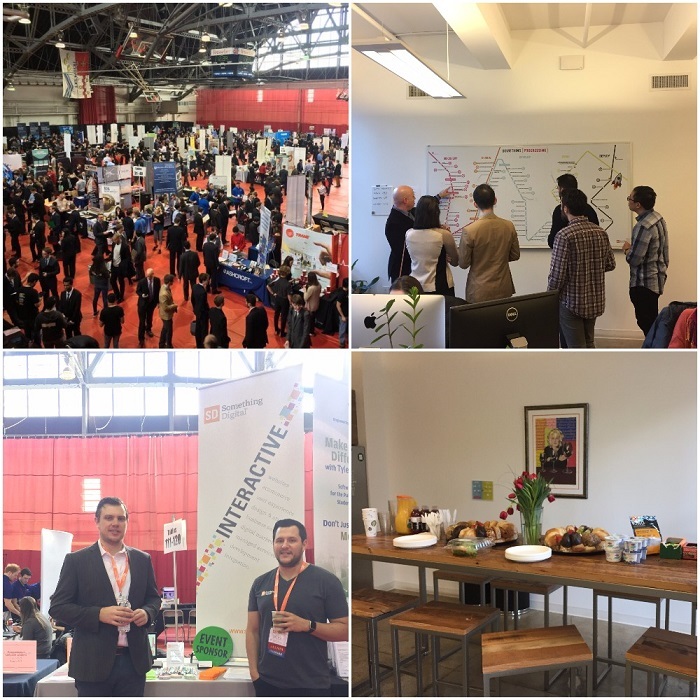 SD employees had the opportunity to participate in the RPI Spring Career Fair and the NYU STEM Career Fair. The CCPD’s annual Spring Career Fair and NYU STEM Career Fair attracts employers from across the country seeking to hire full-time, co-op and summer interns. Students from all five RPI schools (Architecture, Business, Engineering, Humanities, Arts and Social Sciences, Science and IT) and STEM Undergraduate students from NYU Tandon School of Engineering are encouraged to attend the career fairs. Both career fairs combined attracted over 5,500 students and alumni. After meeting a high volume of bright students and alumni from RPI and NYU, Something Digital decided to invite a group back to take part in a two-day Student Workshop. This gave prospective candidates a sneak peek on what it’s like to work at Something Digital by touring our Bryant Park office and engaging employees at their desks! On day two, students underwent a full day of interviews with hiring managers for Development, Project Management and other open roles. We really enjoyed meeting the students and can’t wait to do this again!